When the Yetis are kicked out of their treehouse, it’s up to the Roanokes to win their home back from the Sasquatches that took it over by beating them at roller derby. You just gotta learn to roll with the punches! When the yetis are kicked out of their humble treehouse abode, it’s up to Jo, April, Mal, Molly and Ripley to get them back where they belong amongst the trees…and not leeching the camp’s power and making all the ice cream melt. To get the sasquatches to clear out, though, the Roanoke girls will have to challenge them to a roller derby match! 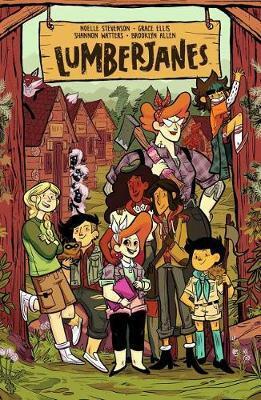 This New York Times bestseller and multiple Eisner-Award and GLAAD-award winning series is written by Shannon Watters and Kat Leyh (Super Cakes) and illustrated by Carolyn Nowak.